Our day began the same way each day of FD competition does, very early! The GT Radial Team all boarded the bus from our hotel as we departed from the city to make to the 30 minute drive through to the Changi Exhibition Centre. As we drove out of the city, the sheer beauty of the city really hits you, the tree covered freeways making a green leafy tunnel and the small pink flowers on the guard rails are a striking contrast to the skyrises and bustling city. The team were much quieter on the ride in to the event, as everyone on board knew they had a job to do and were focused on the day ahead. When we arrived at the event, it was a hive of activity. 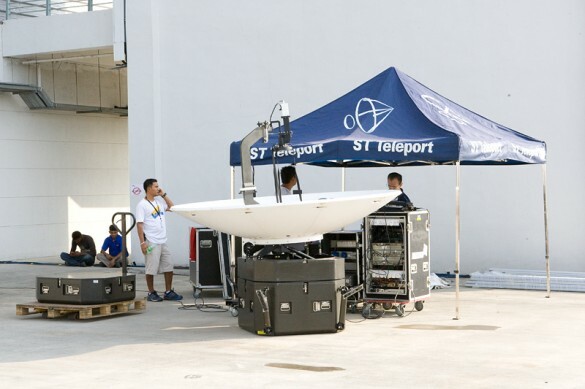 Teams were preparing their cars, staff from ESPN setting up the satellite for the live TV coverage that afternoon and we set up to make our final preparations for competition. The first session in the morning was open practice and we had two hours to get out on track and run the course. 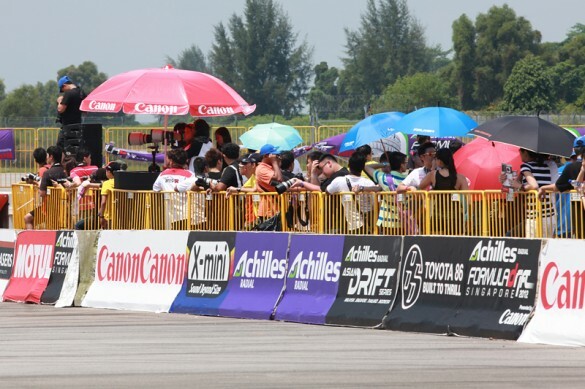 By midday, the crowds had packed in to the sold out event, with every vantage point around the track blocked in by spectators standing shoulder to shoulder and the full grandstand was making plenty of noise as fans cheered on their favorite drivers. My first battle for the day was in the top 32 against Kevin Rajoo and we lined up to fight for our place in the top 16. The track has a fast first entry and we ran close through the course, but I was able to hold my speed through the course and maintain close proximity during my chase run and I was awarded the win, moving through to the top 16. The top 32 battles continued until the top 16 were announced and all the drivers got together for the autograph session. The line up was absolutely massive as we signed hats, shirts and posters for almost 45 minutes non-stop! 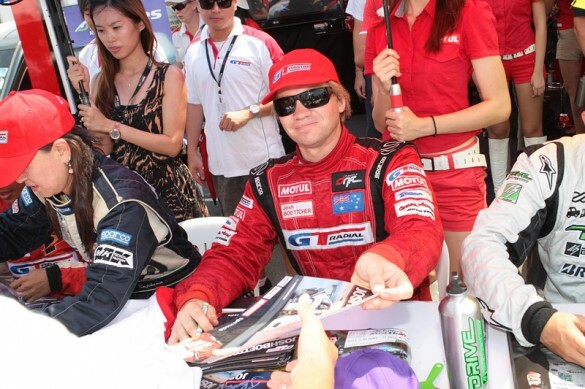 After the main driver signing, I went back to the Motul booth, where I was signing more autographs for fans! As exciting as the autograph sessions are, the importance of the next battle was never far from my thoughts. 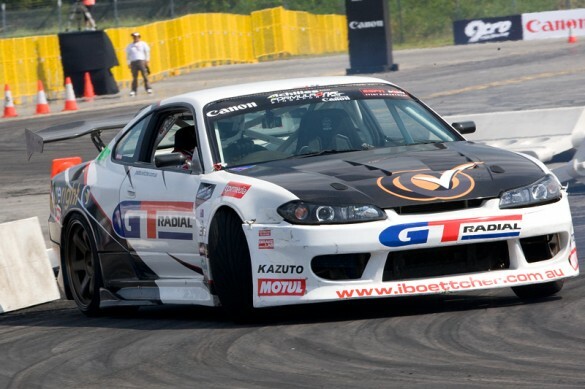 I was to face up against the very talented Robbie Nishida, who is an excellent drifter and has had many years of experience in both Formula Drift and D1. Before the top 16 battles commenced, we lined up for the driver parade lap. Driving out on to the track, we slowly drove round the circuit in front of the cheering fans and lined up in front of the grandstand. With the live TV coverage underway, we were introduced to the crowd by ‘The Voice of Formula Drift’ Jarod DeAnda. We headed back to the start line with the obligatory burnout as the crowd roared with drivers laying down tandem doughnuts in front of the grandstand. Lining up against Robbie, I knew that I would really have to push him to get the win, as he is not easily shaken. He had great speed on the lead run, but I was able to reel him in through the second half of the track. I led on the second run and knew that I had to go all in to give it my best shot. I drove the S15 as hard as it could be pushed and ran a good line pushing right out to the clipping points around the course. Robbie was right on it and drove a great battle. We headed back to the staging area where we waited for the results to be announced. The judges announce that Robbie had taken the win and moved on to the top 8. It was a disappointing finish to the event, as I really wanted to get in to the top 8 to fight for a place at the front of the field. I congratulated Robbie and wished him the best for his upcoming battles headed off to watch the final battles unfold. I was very pleased to watch my friend Robbie battle through to place fourth in the event! 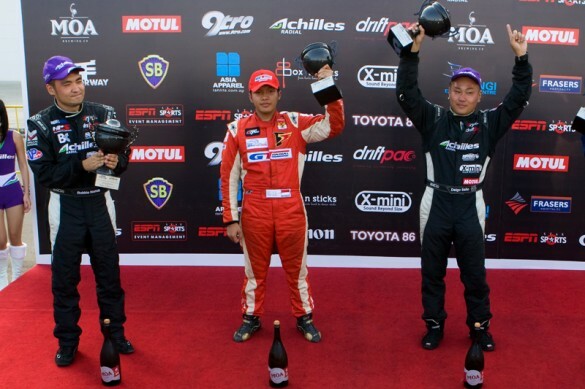 One of the major upsets of the event was Manabu Orido being knocked out early and made for a very exciting final, with GT Radial team mate Rio Saputro Budihardjo lining up against Daigo Saito in the final battle. 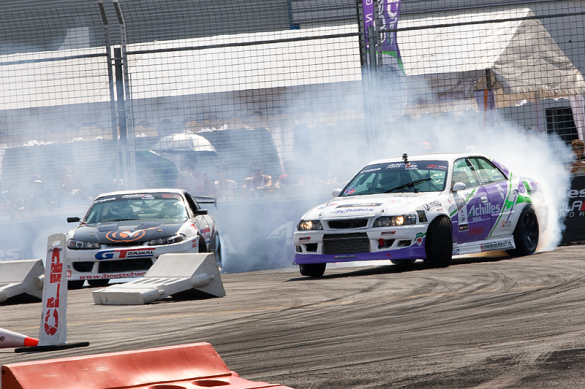 The unstoppable Saito got the win and Round two of Formula Drift Asia came to a close. We then cheered our team mate Rio on the podium in second place and headed back to the pit garage for a team photo! We packed the S15, as she is now heading back to Australia as we prepare her for the next Round of Formula Drift in Thailand. It has been simply incredible to experience a second season of Formula Drift in Singapore and I have to thank my major sponsors GT Radial and Tyreright for making it possible. I also have to give a massive shout out to the wonderful team at Motul Singapore, who have supported me in both Malaysia and Singapore this year! To my traveling team, my mechanic Gavin, wife and spotter Alison, Scott covering the media and his wife Ange on video, sincere thanks for all your help and support! 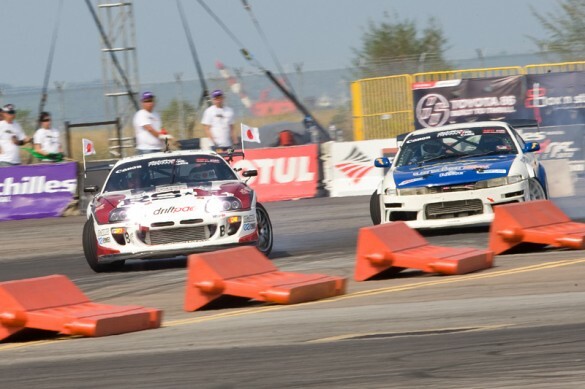 The next stop on the Formula Drift Asia circuit will see us in Thailand in September and I can’t wait!! !